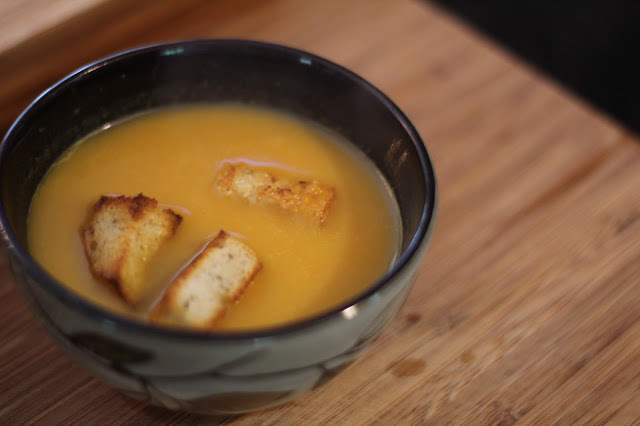 Soup a la Crécy is just simple carrot soup. There are some stories as to how it got its name but nothing definitive. First, Crécy is located in northern France and is known as the region for producing the best carrots in France. Second, there is a story claiming that the soup was eaten every year by King Edward III on August 26 to commemorate the 1346 Battle of Crécy, an event of the Hundred Years War. Whatever the reason, the soup is quite good. 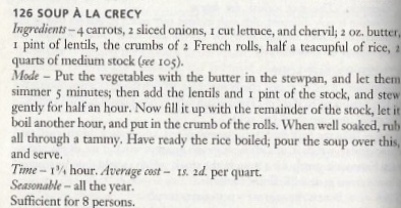 Here is a recipe from the Consolidated Library of Modern Cookery and Household Recipes, vol. iii by Christine Terhune Herrick, New York: 1904. 1. In a large stockpot over medium heat, melt the butter. Then, add the chopped onions and 1/2 teaspoon of salt and cook on low until soft, about 15 minutes. 2. Add the chopped carrots and sugar to the onions and cook about 5 minutes until the sugar is completely melted. 3. Add the vegetable stock and salt and pepper to taste. Bring to a boil then simmer covered on medium-low until carrots are completely soft, about 30 minutes. 4. Using a blender, or immersion blender, puree the soup until completely smooth. 5. Serve hot with croutons (optional).